Using a large saucepan, add the apples, water, regular and brown sugars, lemon juice, cinnamon and nutmeg. Place over high heat and bring to a boil. Once boiling, reduce to a simmer and cook, uncovered, for 35 minutes, stirring occasionally. Remove from the heat and stir in the vanilla. Allow to cool slightly. Once cool enough to handle, place in a kitchen mixer, such as a Cusinart, fitted with a blade attachment and puree until smooth. Pour into a large glass jar and store in the refrigerator. 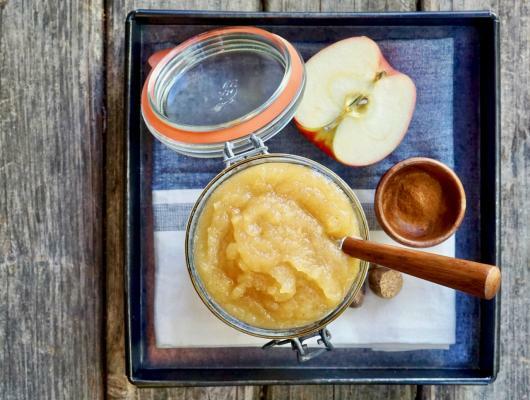 This applesauce will keep for 4 days. Classic apple sauce, an essential for Hanukkah or for anyone who just wants to feel like a kid again.